The PROBUS Club of Central Aroostook held their monthly meeting at NMCC Reed Commons building on Thursday, March 21, at 10 a.m.
PRESQUE ISLE, Maine — The PROBUS Club of Central Aroostook held their monthly meeting at NMCC Reed Commons building on Thursday, March 21, at 10 a.m.
Dave Maxey called the meeting to order and Lucille Hay introduced the guest speakers, Dave DeMerchant and Leasha Fitzherbert. DeMerchant owns Northeast Trophy Company and Norogala Show Ribbons of Presque Isle, Maine. Fitzherbert manages the Norogala Equestrian Show Horse Ribbons department. DeMerchant has five businesses in his establishment on the Fort Road; trophies for school sports and other similar events, taxidermy, embroidery, hats and various other clothing items, sublimation, and award ribbons in every category and description. He started his business in 1985 in his father’s garage. He is also a Maine certified guide, and has been a referee for basketball, baseball, soccer and softball for over 20 years. His love of sports has put him in touch with many coaches throughout the years. He does all the awards and ribbons for 14 state fairs in Maine, as well as wall plaques. 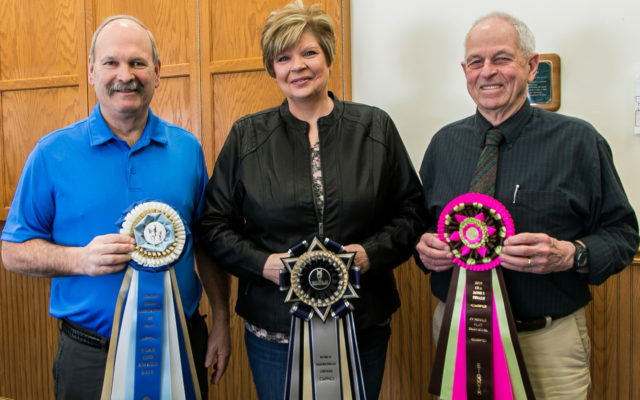 The show ribbon business has grown immensely, with many orders approaching 3,000 ribbons and more per week. All ribbons boast the Made in Maine label. The company is one of only two in New England making all by hand for the 64 accounts they handle. The huge equestrian exhibits in Massachusetts that he and Fitzherbert attend bring them even more accounts for their show ribbons, which are becoming well known and in demand. As well as his current businesses, DeMerchant continues to seek other ways to broaden his enterprises. Many of his workers are retirees who seek very flexible working hours and an interesting way to make some money in a job that is easy to learn and in a pleasant working environment. He is always searching for extra and enthusiastic help. In other business, Janet Snow gave a reading from Robert Harris’s 101 Things Not to Do Before You Die. Today’s reading focus was: Don’t be a Victim of Junk Mail. The meeting adjourned after the secretary and treasurer’s reports.